REAP is kept well short of the $20 million annual support that had been envisioned — a nearly 25-year trend that keeps REAP well short of its potential. 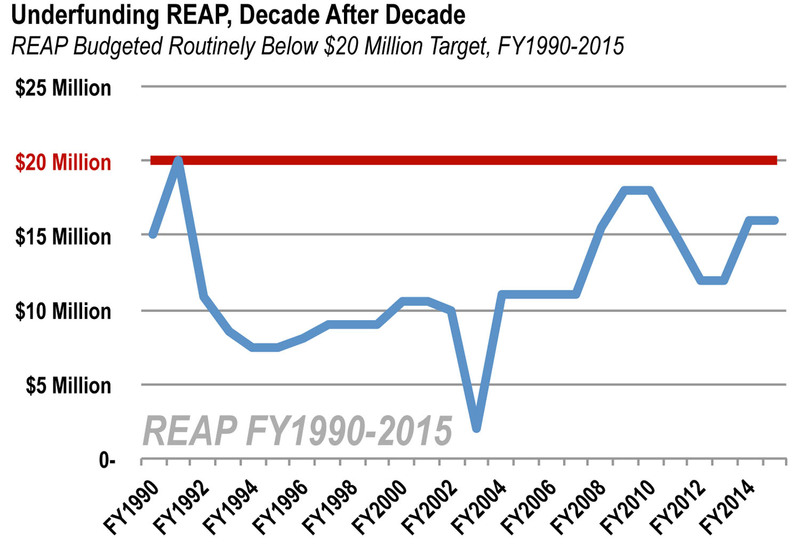 When Iowa’s Resource Enhancement and Protection program (REAP) was established in 1989, the Legislature set its spending authority at $30 million, but funded it at only half that — $15 million. 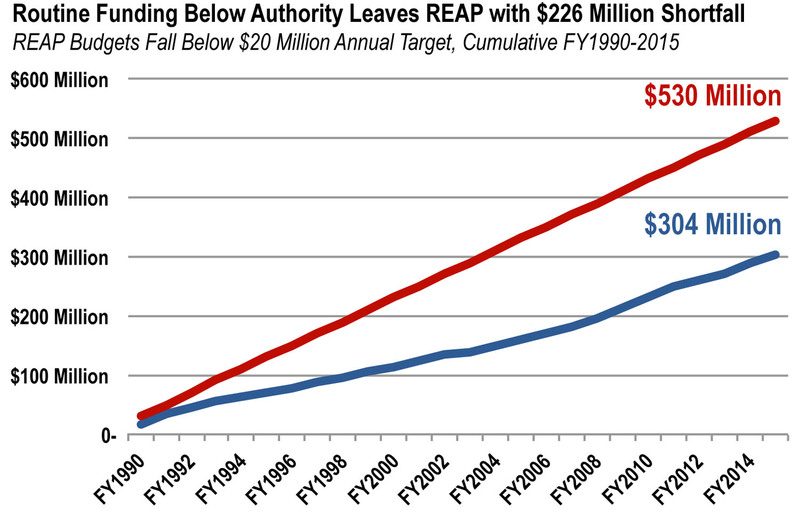 The next year, funding (FY1991) was set at $20 million, an amount we thought was sustainable. It never again reached that level — though lawmakers attempted to set it at $25 million for the 25th anniversary of the program in the just-completed fiscal year. Governor Branstad vetoed $9 million that year, leaving REAP at $16 million for FY2015, where it stands for FY2016 as well. Ironically, the 2014 veto came as the state was promoting its voluntary Nutrient Reduction Strategy. Twenty percent of REAP goes to these programs. The veto reduced funds available to help farmers implement new nutrient runoff reduction and filtration measures that could contribute to the goals of the nutrient strategy. Actions like these contributed to a long-term REAP shortfall of more than $220 million. See our new Iowa Policy Project report, REAP: A Case Study of Stewardship. With a more clear understanding of how REAP can make a difference in our quality of life, all Iowans may evaluate how it should be funded. In practice, REAP is kept well short of the $20 million annual support that had been envisioned — a nearly 25-year trend that keeps REAP well short of its potential. “Choose 2” is a simple but effective concept, but keeps a voluntary component to a solution to a difficult issue. Isn’t it worth a discussion? Where Governor Branstad chooses to promote confrontation, Iowa legislators could be looking for an opportunity to stop chronic pollution of Iowa’s lakes, rivers and streams. The Governor spoke of “war on rural Iowa” after the Des Moines Water Works announced its Board of Trustees voted to issue a notice of intent to sue the supervisors in Sac, Buena Vista and Calhoun counties “in their role as governing authority for 10 drainage districts that are discharging pollutants into the Raccoon River,” threatening Des Moines’ drinking water. The answer is first an acknowledgment that the water problems are real and can be addressed without causing great pain — financially or in health — to anyone inside or outside city limits, upstream or downstream. Supporters of the new Nutrient Reduction Strategy (NRS), which was hailed as a promising effort to improve Iowa water quality by reducing nutrient pollution from the state by about half, plead for more time. A century is enough, say detractors. Agricultural interests have had about that much time to use totally voluntary approaches and nutrient pollution is now a serious problem. At least part of the answer could well be “Choose 2,” which stems from the July report from the Iowa Policy Project, “A Threat Unmet: Why Iowa’s Nutrient Strategy Falls Short Against Water Pollution.” The IPP report offered six ideas to make a voluntary system better. The list is not exhaustive, but the proposals are serious and science-based. The “Choose 2” concept is part of the list, and it is simple: Mandate that every producer, farm owner or renter, adopt two runoff-reducing steps — but let the farmer choose which steps. For the many farmers already taking meaningful steps to reduce nutrient runoff, there is no impact. They have already started to reduce their pollution and can show they have. Those who are not currently taking any steps, and thereby causing the lion’s share of the problem, would have to do something. But they would get to choose from among meaningful approaches that have been promoted by the Iowa Soybean Association, such as cover crops, grassed waterways, contour farming, terraces, bioreactors and conservation uses for oxbows. Producers could take two actions that best fit their operation, land and economic situation. The proposal is simple but effective, and keeps a voluntary component to a solution. Isn’t it worth a discussion? Isn’t it better than knowing we’re allowing the poisoning of our water? Isn’t it better than just calling water pollution someone else’s problem and letting it go? David Osterberg, co-founder of the nonpartisan Iowa Policy Project, is a former state legislator who chaired the House Agriculture Committee and is a professor in the Department of Occupational and Environmental Health at the University of Iowa. Contact: dosterberg@iowapolicyproject.org. See our report: “A Threat Unmet: Why Iowa’s Nutrient Strategy Falls Short Against Water Pollution,” at www.iowapolicyproject.org. Why should no one be surprised by Des Moines Water Works going to court? It is because the Governor and his administration have failed to act. Last week, Des Moines Water Works’ Board of Trustees voted to issue a notice of intent to sue the Board of Supervisors in Sac, Buena Vista and Calhoun counties “in their role as governing authority for 10 drainage districts that are discharging pollutants into the Raccoon River,” which threaten Des Moines’ drinking water. The new Nutrient Reduction Strategy (NRS) was hailed as a promising effort to improve Iowa water quality by reducing nutrient pollution from the state by about half. Research behind the strategy showed that 90 percent of the nitrate pollution coming from Iowa came from nonpoint sources, mainly agriculture. Despite this, state policy was to require cities and towns and industries to reduce their contribution to the nutrient pollution — but to let agriculture producers do whatever they wanted. For them reducing the pollution was voluntary. Insufficient funding — The year the NRS was adopted the Legislature responded with more than $20 million of new funding to support farmers who wanted to introduce new methods to reduce their pollution. In a bipartisan effort, legislators agreed to improve spending again in 2014. However, Governor Terry Branstad vetoed $11 million in similar funding and another $9 million in REAP natural resources and recreation funding — 20 percent of which would have gone to efforts to reduce soil loss that contributes to pollution of our rivers. Insufficient monitoring — The state has supported more than a dozen efforts by local producers and ag businesses to work to improve soil and water protection practices in their own small section of a stream. This is a wonderful opportunity to do water testing to see if the new emphasis is doing any good. Yet, monitoring is not required for this expenditure of taxpayer dollars. Pick two — The Iowa Soybean Association, the one commodity group that seems to take an interest in improving water quality, had supported six examples of methods to improve water quality, such as grassed waterways in fields and planting cover crops to follow corn and soybean crops. Our report suggested that each farmer voluntarily adopt any two of these measures. Not all measures would necessarily be best for each producer but two surely would work. We would let farmers decide which research-backed approaches to use. Set benchmarks and a timeline — There is no timeline for the NRS to accomplish its goal of reducing nutrient pollution by nearly half. The Water Resources Coordinating Council, a voluntary citizen group that is to ride herd on the NRS, has never been allowed to vote on a timeline. Iowa’s Secretary of Agriculture is not interested in setting dates. Will it take 100 years to accomplish the task? We don’t know. And Des Moines Water Works, standing up for all of Iowa, is reminding us all that we cannot wait. David Osterberg, co-founder of the nonpartisan Iowa Policy Project, is a professor of occupational and environmental health at the University of Iowa. If you are promoting a voluntary system to reduce nutrient runoff, shouldn’t you make sure farmers have resources to put sensible measures into practice? Water quality in Iowa is so bad that any new initiative to improve our waters is probably a good thing. That said, Iowa farm groups’ new initiative to take action on agricultural pollution of our waters comes with a troubling rollout. Making the announcement with Governor Branstad not only politicizes water quality, something that should be above politics, but masks the governor’s own decision this year to delay action. The Governor’s veto of $11 million for water quality — funding passed by a divided legislature — makes an important statement about water quality. In addition, the governor also vetoed $9 million in funding for the REAP program, which is used by counties and cities to acquire and protect natural areas and to preserve Iowa’s environment. Twenty percent of REAP goes to farmers to improve soil and water practices. If you are promoting a voluntary system to reduce nutrient runoff, shouldn’t you make sure farmers have resources to put sensible measures into practice? The new group established to improve water quality needs to be taken seriously by the environmental community and by all Iowans. But this rollout does not engender trust. The Iowa Policy Project recently released a report on water quality in Iowa. [See A Threat Unmet: Why Iowa’s Nutrient Reduction Strategy Falls Short Against Water Pollution] We showed that the addition of six new policies to the state’s new Nutrient Reduction Strategy would make it possible for the strategy to succeed. One of those policies is the kind of effort the new farm group plans to push — bringing attention to the problem. A second policy is more funding, and farm group muscle could improve the chances in the Legislature. However, even if the Legislature acts, as in the 2014 session, legislation still has to get by a governor’s veto. Maybe the best starting place to build broad support would be to invite an environmental group to the table, rather than a politician in the middle of a heated campaign. We know plenty who could help.